A lot of aBPM scenarios (in context of BPM and/or standalone applications), custom implementations and/or other components that are running on a PO system needs additional data (e.g. for tasks) that are not to be stored out-of-box inside the database or via BPM API. One typically reason is that an API doesn’t support access to those data (like inside the BPM API for tasks/processes). Another reason can be that the release of your PO system doesn’t support such access in the current version but in the next. Or the data are to granular or not allowed or to transient for a full-blown persistence/database model. Surely the aBPM framework has his own persistence layer, but also here the data will be stored more on a level of an aBPM process and not in the details of a task layer. Inside this blog I want to show you how you can create a very flexible and generic persistence layer for all the data that you want to store with the smallest DB footprint that you ever have seen. 1.1 A generic persistence approach must be very flexible and needs no information about the data that must be stored. The reason is very simple today we know only one or a small list of data that must be stored today, but requirements/application scopes will be changed and next week or the week after additional data are more relevant to store. 1.2 The initial access to this data must be fast, stable and unique. 1.3 The technically transformation from a generic interface into a persist-able format must be encapsulated with some/a lot of service operations that represents most of the use cases. 1.4 A job that can be scheduled via NWA Java scheduler to clean up the database to hold the DB storage in a well state and removed unnecessary data from the DB. 2.1 The answer for the requirement 1.1 must be split into two parts. First the database structure of the data part itself cannot be used multiple columns etc. If it would every change for additional fields depends an extension of the database table. The solution here is a single CLOB column (character large object). Such a database column will be manage and extended (the space inside the database) by the database itself. 2.2 The solution for requirement 1.2 is a unique id like the BPM task instance id or a unique user name or an own generated unique identifier. For additional task data the BPM task instance id would be the best, for additional user data the unique logon name. The identifier could be realized with a string column for a primary key. 2.3 Requirement 1.3 can realized via a stateless session bean (EJB) with JEE default approaches. The implementation itself must transform the Java objects (like a DTO that separate the service from the persistence layer) into the generic XML format. 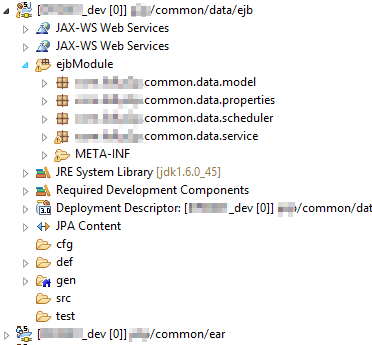 The data will be stored with regular JPA entity objects and operations via Persistence Manager. Hint: If JPA could not be used, also regular SQL queries via JDBC calls are possible. Hint: In my case the name of the EAR DC differ from the EJB and DIC DCs only whereby the fact that the EAR DC exists before and I have reused the existing DC for deployment. The classes contains default getter and setter operations to work on there content. 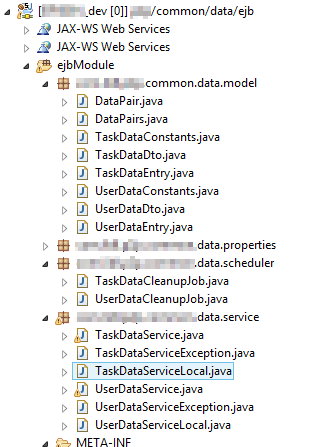 The TaskDataService contains the implementation of the corresponding interface, that used JPA queries to create, update or delete the additional task data inside the generic persistence table.